In this Year of the Eucharist proclaimed by Pope John Paul II (October 2004 – October 2005), we are called to reflect on the great Mystery of this Sacrament. There is no doubt that the most evident dimension of the Eucharist is that it is a meal. 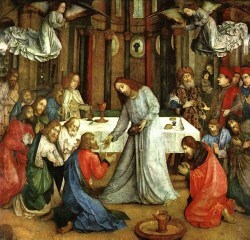 The Eucharist was born, on the evening of Holy Thursday, in the setting of the Passover meal. Being a meal is part of its very structure. "Take, eat... Then he took a cup and... gave it to them, saying: Drink from it, all of you" (Mt 26:26, 27). As such, it expresses the fellowship which God wishes to establish with us and which we ourselves must build with one another. Kathleen Pluth, Communications Director for the Washington Theological Consortium, offers us a timely gift in this her original hymn text, written for the Solemnity of Corpus Christi. Working toward her Licentiate degree in Sacred Theology at the Dominican House of Studies in Washington DC, she has completed a cycle of new hymn texts for the liturgical year, updating traditional images and using Scripture from the Lectionary for each of her new hymns. CanticaNOVA Publications will be releasing these hymn texts this summer in our volume, Hymns for the Liturgical Year, by Kathleen Pluth. The preface, The Holy Circle, can be viewed on our website already. At the author's suggestion and with her kind permission, CanticaNOVA Publications offers this preview of the Eucharistic hymn from the collection, which you may use free of charge in your parish, particularly during this Year of the Eucharist. We ask that you include the author's name and the copyright notice on any copies you make for choir or congregation. How light the bread of angels upon the human tongue! This precious weight of glory that binds the Church in one! Of mind and heart and memory caught up in heaven's kiss. How blessèd is this banquet, Christ's sweet and costly meal. As God the Holy Spirit effects the sacrifice. The glad'ning stream of heaven swells to a mighty flood. Of saints He makes from sinners with skillful healing arts. Until that happy morning when dawn turns into day. The Father and the Spirit, and Christ, our all in all.